SMS in ONTRAPORT allows you to have two-way communication via text with your contacts. Respond via SMS to keywords they text to your account (example: send an SMS with a link to your presentation in Google Slides when they text you the word "slides"). Fire other automation based on the content of SMS messages received (example: add them to a Campaign when they text you the word "slides", and have the Campaign tag them, send an email with a link to the slides, and create a Task for your team to follow up). Relay the text of a received SMS to yourself or other team members. Send broadcast SMS to Contacts (please see warning below). Note: The receiving carrier may filter your outbound SMS and discard them if they note too many being sent to their customers, or if the content appears to be risky. See this article on Carrier Filtering and Spam Blacklisting of SMS from our partner Twilio. To use SMS for bulk marketing (i.e, more than 30 identical SMS per carrier sent at once) you should use an SMS Short Code number instead. Enter a name at the top left. This is just for reference and is not shown to Contacts. Select your country from the drop down. Enter your area code. You can leave this blank if your country does not use area codes, or uses a single area code for all mobile numbers. Click inside the Available Number drop down to see the numbers available. Select a number from the list and click the √Buy Number button at the top right. Add the voice response text you would like read to anyone who calls your SMS number in the Voice Message box. This is used to advise them the number is for text messages only, and provide your office number. Example: "Thanks for calling XYZ Company! This number is for text messages only. Please call our office at 555-555-1212. Thank you!" Optional: Instead of typing text into the Voice Message box you can record a message using a MP3 file, and upload that file to the File Manager. Place the URL to the file in the Voice Message as shown in this image and the message will play when someone calls your SMS number. 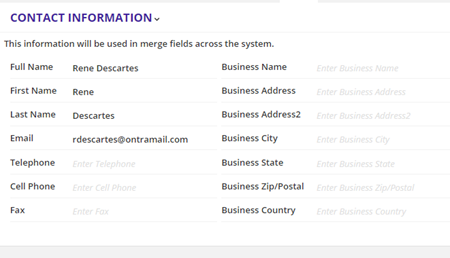 The SMS Number field is a default system field in ONTRAPORT, and is located in the Contact Information section. It is not connected to the Mobile Number field. 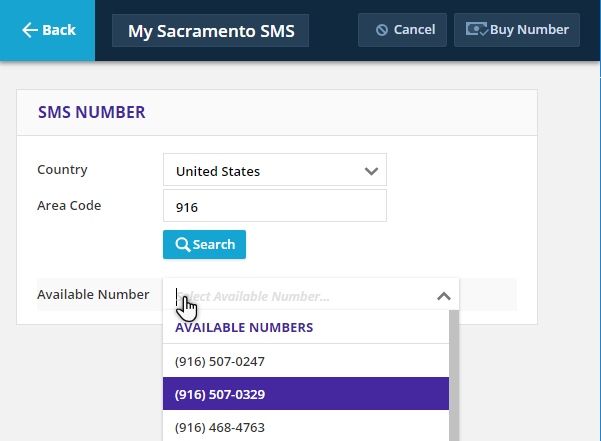 SMS numbers are a special field in ONTRAPORT. You can import the number, but cannot send to the SMS number without specific permission. Your contacts will have to fill in a form with that number, or text your ONTRAPORT supplied SMS number to initiate SMS usage. The contact record's Country field, as shown in the image above. This field can be auto-populated by geo-location based on the form submission when an opt in form is used. Support can turn off geo-location for your account if desired. If there is no Country set in the contact record, the Contact Owner's country setting takes effect. 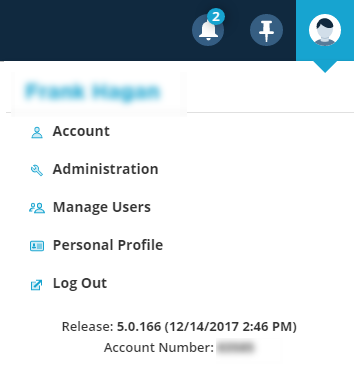 This allows you to automatically format the SMS numbers of contacts assigned to a regional salesperson or business division. See Set the Contact Owner's Country Field below for more information. If no country is specified in either the contact record or the Contact Owner's information the number will be formatted in the US / Canada format with a +1 country code. The Contact Owner relates to the ONTRAPORT Users you've created in your account. To edit the User information, click on the profile icon at the top right of the screen, then select Manage Users. Click each User and click Business Country to edit the country field. Manually entering or importing the SMS number without a country code will trigger the addition of the country code under these rules. Numbers already formatted with a country code will be added or imported as is, and will not be changed. Contacts who opt in via SMS, by sending a text message to your ONTRAPORT SMS number, will have the country code associated with their opt-in number. ONTRAPORT allows you to send bulk SMS messages to people who have opted-in to receive messages from you. and allows contacts to opt-out of your list at any time by replying to an SMS message with one of the unsubscribe words listed below. The contact can can change their status back to Opt-In by replying to an old SMS message or sending your number a new SMS message. No keywords are required to opt in; any received message will opt them back in. Unlike the initial opt in (see below), ONTRAPORT will keep track of their SMS number and knows which Contact Record it belongs to. A Contact can opt in by sending a text to your number, or by filling out a Smart Form and entering their SMS number into the SMS Number field (note: only the SMS Number field is used for SMS). "Text your email address to my SMS number at 555-555-1212" (using your ONTRAPORT number for "555-555-1212" of course). When your prospect texts their email address ONTRAPORT will check to see if that email address exists in Contacts and, if it does, update that record with their sending SMS number and set the Bulk SMS Status field to "opt-in". 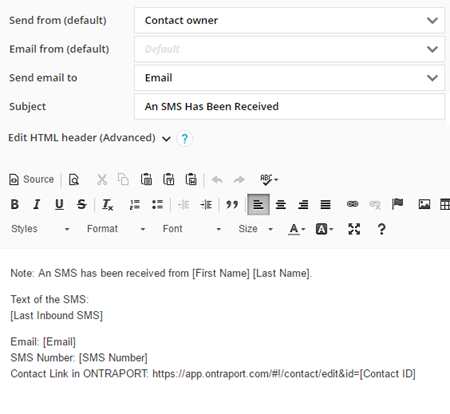 If the email does not exist in ONTRAPORT a new contact record will be created and the SMS number added to it. "Text your First name and email address to my SMS number at 555-555-1212" (using your ONTRAPORT number for "555-555-1212" of course). The prospect will text you something like "Richard richard@ontramail.com". ONTRAPORT will check to see if the email address exists, and if it does, update the First Name field in that record and add the sending SMS number, with the Bulk SMS Status field set to "Opt-in", to the record. If the email address doesn't already exist ONTRAPORT will create one with a first name, email address and sending SMS number. The Bulk SMS Status field will be set to "Opt-in". "Text your first name, last name, and email address all on one line to my SMS number at 555-555-1212" (using your ONTRAPORT number for "555-555-1212" of course). Like the previous examples, ONTRAPORT will match the email address to any Contact Record, update the first and last name fields, add the sending SMS number and set the Bulk SMS Status field to "Opt-in". Contacts who have set their Bulk SMS Status to “Unsubscribed” can change their status back to Opt-In by replying to an old SMS message or texting your account's SMS number. Any received text will toggle the Bulk SMS Status back to Opt-in. ONTRAPORT will set the Bulk SMS Status to Hard Bounced if a message was sent and it bounced. Reasons could include an invalid phone number or an unsupported carrier. Because there was a message sent, hard bounced messages will incur the regular message cost. SMS numbers are available in many countries including Australia, Austria, Belgium, Canada, Estonia, Finland, Norway, Poland, Switzerland, the UK and the US. The first SMS number you set up is free of charge. The second and subsequent numbers incur a monthly charge of $5 each, except in Estonia ($7 per month) and Australia ($10 a month). Note: Messages over the carrier's limit, usually 160 characters, are split into multiple messages and the charges below are assessed per message segment. 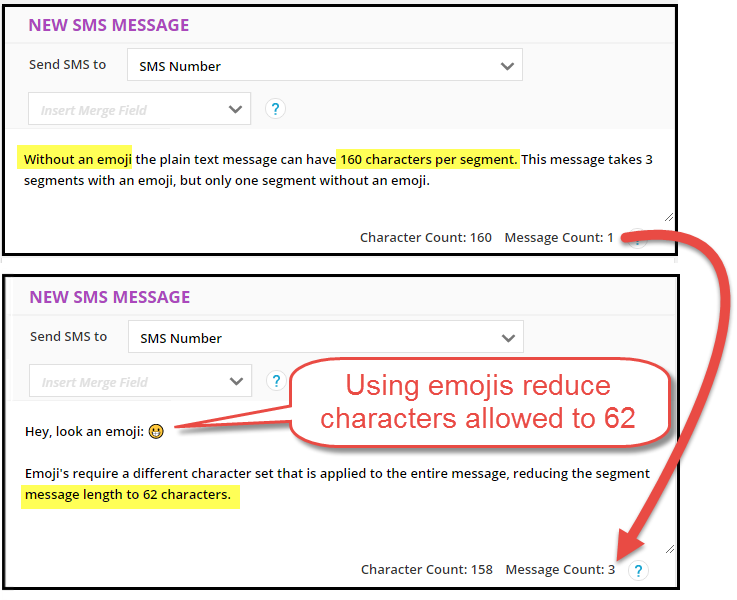 If you use an emoji in the message, the message is sent using a different character set and the limit is reduced from 160 characters per message segment to 62 characters. Split messages are usually reassembled by the receiving device, so the impact of this limitation is usually seen only in the cost of the message. The SMS editor will show the character count and message count required to send the message in the lower right. Each message segment will incur the approximate cost shown in this pricing table. 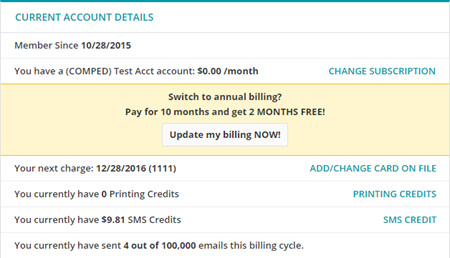 The monthly fee for additional SMS numbers is billed on your ONTRAPORT billing date. Usage fees are billed to the card on file the day after the messages are sent or received. ONTRAPORT allows you to set up a conventional telephone number for use in sending and receiving SMS messages within the application. You can select SMS numbers from many countries, including Australia, Austria, Belgium, Canada, Estonia, Finland, Norway, Poland, Switzerland, the UK and the US. You can select a number from the area code of your choice. In some countries the area code is the same for all mobile numbers. You can leave the field blank in that case. The first number is free of charge. The second and subsequent numbers cost $5.00 per month except in Estonia ($7 per month) and Australia ($10 per month), and are billed in addition to other ONTRAPORT account fees on your normal billing date. Usage fees are charged per SMS sent or received at $0.02 per SMS in the US, and $0.06 per SMS in most other countries. Usage fees are billed to the credit card on file the day after they are incurred. Conventional, regular format SMS numbers are used for two way communication between you and your customer. They can be used for appointment reminders, birthday greetings, product fulfillment and any other "low volume" use without problem. If you are going to mass market your offers via SMS, sending out hundreds of SMS at a time, you should use a Short Code SMS number instead of the conventional format (see below). For mass marketing, sometimes defined as sending more than 30 SMS to a single carrier at the same time or more than 200 messages a day, you should use an SMS Short Code number. Carriers are more and more likely to throttle or discard SMS numbers from conventional numbers that they feel are mass marketing messages or risky. See this article on Carrier Filtering and Spam Blacklisting of SMS from our partner Twilio for more information. Contact Support if you’re interested in exploring the option of getting a short code number. This article has more details: SMS Short Code Numbers for Marketing. SMS Messages are stored in the Messages Collection, along with all of your other messages! To create an SMS message, open Contacts > Messages > New Message and then select SMS as your message type. As with other message types, SMS messages can also be created while editing a sequence or wehn adding an SMS element in a Campaign. Merge fields are OK in SMS. Watch out for total message length! SMS messages support formatting with line breaks. However, not all carriers will render the line breaks when delivering to individual handsets. SMS formatting with line breaks is supported but not guaranteed to work to all recipients. If the message length is greater than 160 characters, ONTRAPORT will send as many 160 character messages as it takes to send your message, up to 1600 characters. For US based messages, charged at $0.02 each, a 200 character SMS split into two messages will cost $0.04 to send. In other countries, charged at $0.06 per SMS, the message would cost $0.12 to send. The receiving carrier may deliver split SMS in reverse or random order. Unfortunately, we cannot control the sorting used at the receiving carrier. Any characters over 1600 will be dropped without any notification. Note that the total number of characters available in multi-part SMS messages is lower because of the use of “(1/x)” in the message area. You can send a one-off SMS message to a single contact or to a group of contacts. SMS messages sent to a single contact are sent immediately, while broadcasts are sent via the broadcast queue. Note: Many carriers have strict spam filters and may detect if you are sending more than one of their subscribers a message at the same time. If your message trips a filter they will simply discard your message without any feedback, and may block your sending number. If you desire to send broadcast SMS messages we recommend you purchase a short code SMS number. It is safer to send SMS messages through a Campaign or other automation rather than a broadcast. 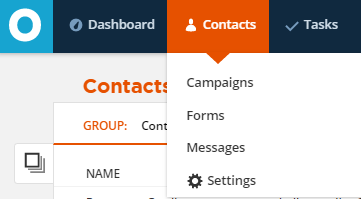 You can send SMS messages to your contacts who are subscribed to a Campaign by adding an SMS action element to the Campaign map. This does not usually trigger the spam filters and is a more robust delivery method. You can send SMS messages to your contacts who are subscribed to a sequence by adding an SMS step to the sequence. You can send SMS messages in response to receiving an SMS message or some other behavior that’s monitored by rules. Note: Rules act on incoming SMS only if the Contact already has a Bulk SMS Status of Opt-In. For example, Rules will not fire against the initial SMS used to opt-in. For live conferences, ask attendees to first opt in by sending a SMS to your number with just a keyword such as "SLIDES" or their first name, last name, and email address (all on the same line). Rules will fire against the content of each subsequent SMS, so they can text you "Free eBook" and a Rule can act, add them to a Campaign or Sequence, and send them the eBook. The location of the number you are sending from determines the countries you are allowed to send to. You can purchase additional SMS numbers in other areas if you need to reach a country out of your home region. An account in Australia (Oceania region) can purchase a North American based SMS number to send SMS to the 34 countries in the North America region. 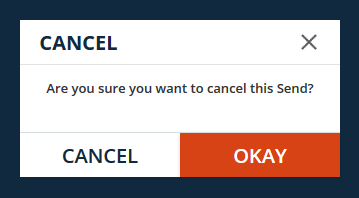 Select the Cancel button in the Actions drawer. With a standard SMS number, messages may be sent at the rate of 1 message per second per SMS number. With a short code SMS number, messages may be sent at the rate of 30 messages per second. There can be at most 14,000 SMS messages queued per number at one time, which is 3.8 hours of messages. If the number of messages queued exceeds 14,000, the newest messages will be dropped from the queue without any notification. Provision an SMS short code number or spread your messages across several standard SMS numbers if you expect to exceed 14,000 SMS messages. All automatic actions, including reply SMS messages, are handled by Triggers, Goals and Conditions in your Campaign Maps. 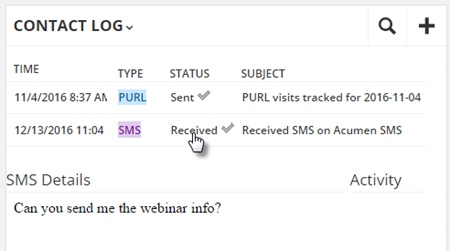 There are Triggers, Goals and Conditions called SMS Received from contact. You can choose the SMS number to which you’d like to have the element attached if you have more than one in your account. Return SMS messages sent to respond to a received SMS message are sent immediately. They do not go through the broadcast queue. 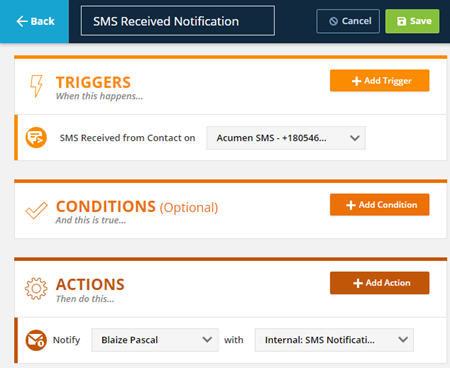 To receive notification of any incoming SMS, create a Trigger, Goal or Condition and select SMS Received from Contact. To receive notifications via email, add an Notify with an Email action element. To receive notifications via SMS, add a Notify with SMS. When an SMS is received ONTRAPORT will send this email as specified, and the merge fields will contain the contact's data (even though the Notify with SMS/Email element is sending the message to you). You can also see the content of the received SMS by opening their Contact Record and view the Contact Log on the Contact History tab. Contacts can update their preferred email address automatically. If an existing Contact has opted in for SMS messages, they can send an SMS that starts with their new email address. 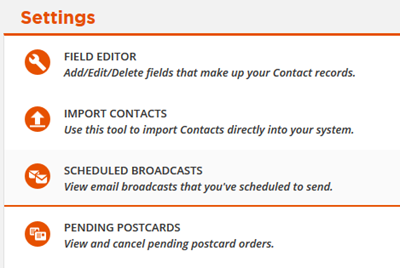 The contact record will update with the new email address. Both sent and received messages are stored in the Contact’s Contact Log. You can view the content of messages that have been sent and received.